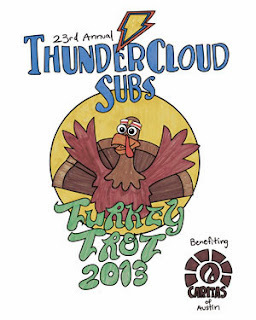 One of our family's newer traditions is to run the Turkey Trot on the morning of Thanksgiving. What better way to spend a day dedicated to eating and thanks, then to burn some calories! No guilt eating two slices of pie later that evening! I have run this race for years, but only in the last few years has my family joined me. * You do not need to be a runner to do this race. Or even a jogger. All ages, sizes and shapes run or walk this race. * Bring turkey paraphernalia. One of the highlights of the event is watching all of the creative turkey head gear. * Getting there -- the traffic down Barton Springs is **crazy**. Find an alternate route, if you can. Looking at my notes from last year, we should have left our home in South Austin by 8am in order to have a comfortable time getting there by 9:30am. Of course, we didn't. Last year I just happened to have my bike in the car, and wound up jumping out and leaving the family in the car, so we could get our packets on time! It actually worked out pretty well! * Parking -- There is plenty of parking at the Long Center, but it took us an hour to get out of the parking garage on the trip home. Again, an earlier start might have meant a better parking spot! Or an alternate parking area! * Finishing the race. As I mentioned, there are a lot of people. It always helps to pick a meet up place after the race, in case everyone gets separated. An easy location to pick is the packet pick up booths in front of the Long Center. As summer creeps on, the temperatures creep higher and kids start becoming bored with the same old routine. To spice it up, try out a different pool in Austin! This pool is perfect for the wee ones. In addition to its standard lap pool, this swim center has a graduated beach area with a fun frog sliding board. For the kids 48 inches and taller there are the two tall slides as well as a lilly pad crossing area. The lilly pads area was fun to watch, as the kdis attempted to cross in any manner than the expected - rarely touching the rope conveniently hung across the top to assist! And another draw to this unique pool is the giant chess board. What better way to exercise the mind after exercising the body! * Children must be 48 inches to go down the slide and must be able to touch the rope on the lily pads. We saw at least one little tike turned away with tears as he wasn't tall enough. So if you have wee ones, you might want to forewarn them! We have been to Krause Springs before (link) but this week we tried a slightly different approach. Dave couldn't take the day off, so instead of heading out first thing in the morning, we left mid-day and arrived around 4pm on a Monday. Krause Springs is located in Spicewood, Texas, about a half an hour west of Austin. It is a privately opened swimming hole with multiple freshwater springs on the property. Their sign says they close at dusk; the woman behind the desk told me around 8pm they close the camp to all but the campers. It turns out, this is a really nice way to do Krause. Many of the day trippers were leaving right around the time we arrived, so the place wasn't crowded at all! Dave proving that back surgery a year ago isn't going to stop him! And this time, we tried something new: jumping off the cliffs. Maybe not the smartest idea, and my ears are still ringing, but it was a lot of fun :o) When we went, the water at the bottom was about 12 feet deep, so our feet would lightly sink into the bottom, but there was plenty of water to buffet our fall. As always check the depth of any water before jumping into it!!! After we had all cooled off in the springs for two hours, we headed up to the picnic area for some dinner. Krause has a great picnic area, with lots of grills and picnic tables, all shaded by the huge cypress trees. And the freezing cold pool is right there, if you get too hot! As you can see from the photos, due to the late hour, we had the place mostly to ourselves! We enjoyed relaxing in our chairs with the sounds of dusk falling around. Around 8pm, we packed up and headed home. Another benefit to the late hour was that we trekked out in the cooler evening, instead of the hot mid-day sun! * Krause does not allow glass - so make sure whatever you bring comes in a can or plastic bottle! * Krause only accepts cash, so stop at the ATM beforehand! * As I mentioned in my previous post, this place is a lot more fun if you bring some floats to hang around in! * There are essentially three levels to Krause, the entrance and butterfly garden, the pool and picnic area, and the springs. So, it can be a bit of a haul up and down the hill if you have a bunch of stuff. Bring a rolling cooler and leave it at the picnic area; just carry the necessities (drinks and tubes) down to the spring area! * Take some time to look around the grounds, this is a really beautiful place! Mary Searight Moore Park, located in South Austin near I-35, is a pretty fun park in Austin with something to do for everyone! However, the hidden gem of this park is located in the far South corner, where Slaughter Creek runs along its edge. This creek is supposedly known for good bass and perch fishing. The boys and I pulled our gear out for the first time this summer, and decided to give it a try. We parked in the main parking lot, and then hiked the distance to get to the creek. While it was a nice hike, it turns out that there are some closer areas to park, if fishing is all you are interested in. From Decker Prairie road, the creek is less than a half mile! We followed the paths (generally just heading south) and finally came upon the creek. There is a small fishing pier perfect for fishing from. The trail then hikes west following the creek. We stopped at many points along the path to try our luck! At one point, two geese started honking at us. Whether you are interested in fishing or hiking, it is a really an enjoyable trail! Heading back east along the trail, the stream has a sort of dam, and then trickles along until it runs into another spring. At that point, the creek widens again into another pretty pond. While we were completely unsuccessful in catching any fish, we had a really nice hike and a good time! * Bring lots of water, the path is sunny and hot! * Note the parking tip above - if you want a quick trip to the creek, you might not want to park at the main entrance, but instead try the Decker Prairie Road unofficial side entrance! What: See solar cars compete head-to-head on the race track! Who can come: You! This event is free and open to the public. 23 universities are participating, 22 of which are using solar panels made by SunPower, one of the main event sponsors. Students built and will race the cars. Join us at Circuit of the Americas and keep an eye out for the SunPower table, where Circular Energy will be sharing information about solar and signing up homeowners for solar assessments with a design consultant. A really fun event is occurring at the Circuit of the Americas tomorrow: the Formula Sun Grand Prix 2013 and the best part is that public entry is free! The race - or rayce - as they call it ;o) consists of three 8 hour racing days. The objective is for the teams to complete the most laps within that time period. The cars charge up their batteries the afternoon before and then run the entire next day on the batteries, as well as any other solar energy they soak up while racing. Universities and colleges have sponsored teams for the last year to completely design, build and test their prototypes. And it all culminates in these three days of racing. According to the webpage, the last two days have been open for public viewing but we had to show the webpage to the security guard and have him talk to his manager before we were allowed in! They were all very friendly and nice, but we were obviously the first spectators to come! The cars take around 5 minutes to traverse the entire 3.4 mile track, and there are a maximum of ten cars entered into the race. Although we went today, the big public viewing day is tomorrow from 9am - 5pm. There will be displays and talks about alternative energy as well as a workshop where kids can build a model solar car. The teams will be available to answer questions and for autographs! These are a bunch of college kids, so they are really fun and easy to talk to! It was really neat to see the various designs of solar cars and to cheer when the UT car went by! * An average solar car can run for around 120 miles on just a battery charge, and around 200 miles if it is running in the sun. * The maximum speed allowed for the cars is 65 mph, though most cars were going much slower. The whole project is a balance of energy usage! *Teams run from around 15 persons to as large as 100, though most of these teams seemed around the 15-20 person mark. *Yesterdays winning car completed a total of 66 laps or 224 miles! Even if you aren't all that into cars, this is a really fun race to see. And a great opportunity to see the Circuit of the Americas at its lowest cost: free! Although we didn't make it up there, they do offer tower tours for $15 per adult, and $12.50 per child, which sounds like a lot of fun, and a great view! This week, we visited Natural Bridge Wildlife Ranch just north of San Antonio and we had a fantastic time!! This May, Natural Bridge experienced a wonderful and unusual event! Twin giraffes were born and survived. This is a rare occurrence, as mothers carrying twins frequently abort or one of the twins doesn't make it. In fact, this pair is the only set of twins currently living in the US and one of only two twin giraffes ever born in the US! They were born on May 10th, so they were just over a month and a half old. The boy giraffe was clumsily cute. At one point, he actually tripped over his long legs trying to move toward the fence! And watching the mama giraffe care for her young was really special! If you get a chance to go out and see them, it is well worth the trip! After we had parked the car and checked out the giraffes, we took a tour of the facilities. There are some gibbon monkeys, parrots, lemurs and a variety of other animals in cages. But the true excitement comes during the safari drive! I had read reviews of visitors only seeing two animals in their whole trip, so in the first few hundred feet, I feared that would be our case. But almost immediately, we found all sorts of creatures roaming the prairie. As it was early morning, many of the animals came directly up to the car to be fed. While the official rules state that you should not feed the animals directly from your hands, we were told that is more of a 'technicality'. And most of the animals were very accustomed to approaching the car looking for a handout! In the case of this ostrich, he came a little too close ;o) That beak looked mighty sharp! One of our favorites were the miniature donkeys. (I'm sure they have some different and much fancier name, but that's what they looked like to us!) In trying to reach the food, they would curl their lips back into a hilarious grin! As it turns out, late spring or early summer is a great time to visit the ranch. There were all sorts of baby animals along the way. While the babies rarely approach the car, you can see them just slightly off the road. Above is a cute one we caught halfway through the trip. After we completed the tour, we wound up back at the main barn. We discovered, in addition to the caged animals, a small petting zoo with many goats. The kids had a great time getting up close and personal with all the animals! * The key to having a great time is to go *early*. We arrived right around 10am, about an hour after they had opened. The day was still cool, and the animals mostly unfed, so we had a great experience. I'd bet we wouldn't have seen so many animals had we arrived much later! * The driving tour probably took us around an hour and a half. We went slowly and took our time. Generally, we only moved on when a line had formed behind us. I'm sure we could have made it through quicker - but that's not really the point. ;o) This didn't include time in the petting zoo, checking out the giraffes, or lunch. All told, our total visit was probably around 3 hours. * The entrance fee includes unlimited trips around the park for the entire day. We were tired and hot, and didn't make it around a second time, but keep in mind that it is an option! * The ranch's main area has a cafe with a variety of fairly reasonably priced fast food. There is also a nice covered pavilion if you choose to bring a picnic lunch. * If you're looking to save a few dollars, there is a $2 off coupon floating around the web that is good until the end of this year. I think it might even be available on their webpage.